As I'm in the process of de-Holidayizing my house, I'm moving the dark and cozies out, and all of my light and fresh in. I'm replacing my Woodland china with powder blue, and wool plaid with pale blue cashmere - it is still January, after all. 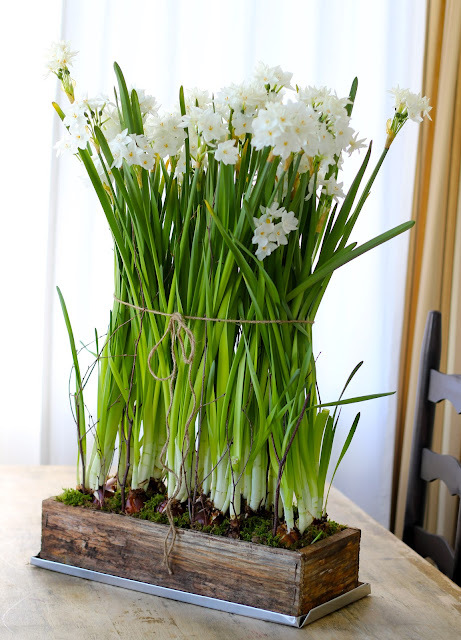 One thing that definitely brightens our home is this living arrangement of Paperwhites. Isn't it stunning? I can't wait to start another planting when the paperwhites have finished blooming. I'm thinking a thick planting of hyacinth. They will smell so good! I love growing bulbs indoors. Did you notice how there are twigs around the perimeter of the box to support the tall stalks? They got a little too heavy even with the twig supports, so I tied them with natural twine. A thick satin ribbon would be lovely, too. They started to get too cold on the sun porch, so they are living here for the moment... which is nice because it helps to keep the mail/keys/dog leash/phones from piling up here. I'm looking to create a new organizing space for all of our 'stuff' that gathers on the counter. Any ideas?! I always think my place looks empty and sad when I put all of the Christmas decorations away, so I love that you use paperwhites as an uplifting transition! Also, I love your use of twigs and twine for extra support! How beautiful! I seriously just tweeted a few hours ago asking if anyone had any ideas how to plant a paperwhite bulb. I was given one at Plow and Hearth the other day (it's huge!!) and I really want to plant it but don't know how. Would love any ideas! To "Force " a bulbous plant is to literally trick it into flowering out of season, The process is simply , i was never able to grow anything and i just had the best holiday ever with the wonderful paper whites i forced some i force in water and some i forced in soil. Last week I force over 4 dzs in several pots and they are happily coming along and are smelling heavily as they are very fragrant. 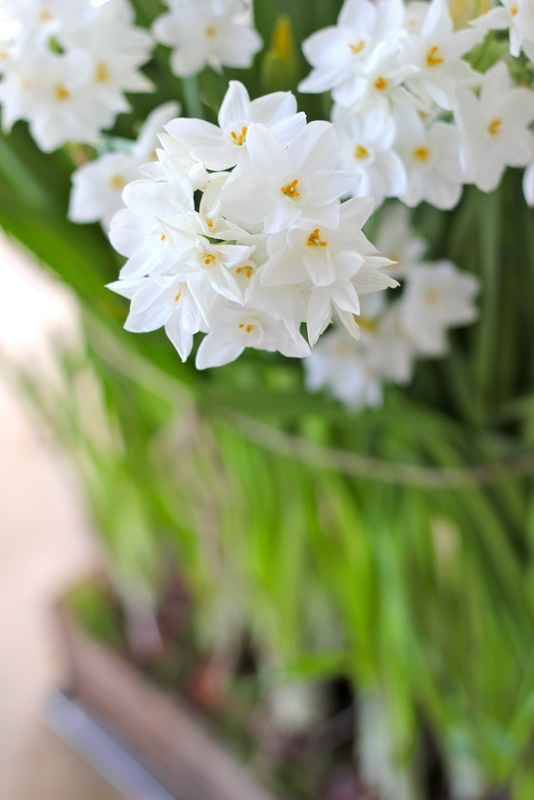 also interesting All plants in the Narcissus genus which paperwhites are, owe their name to the mythical Narcissus Angered by his self-absorbed gaze at his own reflection,the goodness Nemesis withdrew his right to humanhood, transformed his feet to roots,and condemned him to a life of flower. Not so horrible, in my opinion! That is very simple and pretty. Ok so I am not good at gardening. What exactly are the steps to make this cute little paperwhites arrangement? Do I just plant bulbs in a cute planter box with soil and have them in the light and watch them grow? Is it too late to plant them and have them turn out? Someone please let me know.